One of the things we love about Nantucket is that things don’t change all that much (except the crowds that keep getting larger each summer) Twenty years ago Black-Eyed Susan’s, The Pearl and the Straight Wharf were hot reservations, and they still are favorites today. Heading to the island this August after a few years’ hiatus, we asked a local friend for her favorite places to eat and her list of The Nautilus, Station 21, and Cru was the same as three years prior. You still must get the Caprese or Turkey Terrific sandwiches to take to the beach from Provisions or healthy wraps at The Green. You still need to rent bikes at Young’s and head out to Sconset or Madaket on the islands bike paths. And you definitely must head to the Cisco Brewery for happy hour drinks, live music on the patio and snacks from the rotating food trucks or raw bar. This year, unlike previous visits where we rented a house, we checked into the lauded and highly touted, The Wauwinet, located on the northeast shores of the island. Let us just say we wouldn’t check in again on future trips. 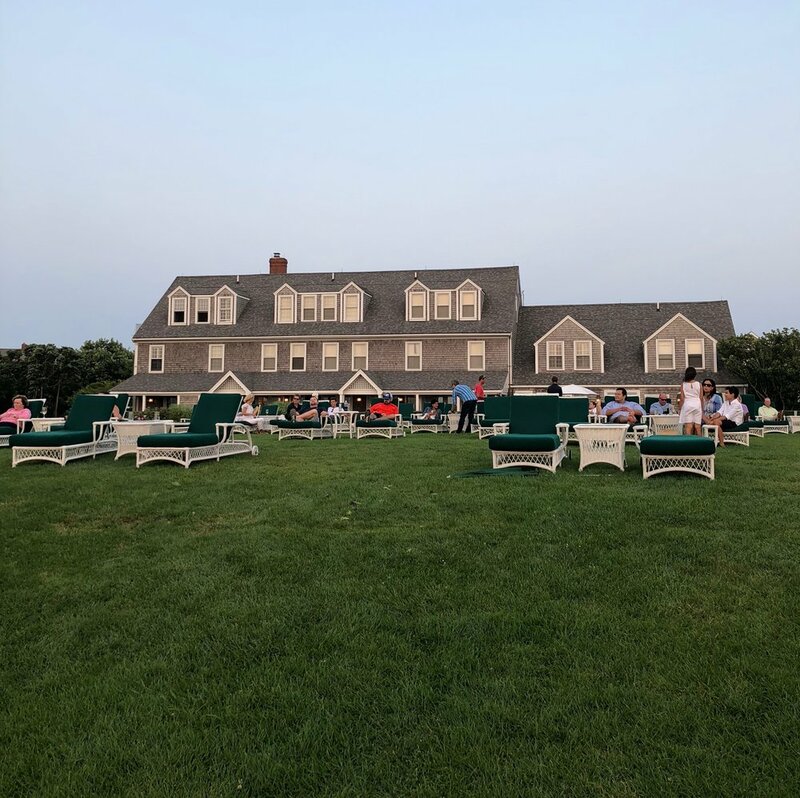 Our Take: The setting of The Wauwinet is sweet, framed by the Atlantic Ocean and Nantucket Bay with access to two beaches, a narrow one on the Bay and a more desirable one on the Atlantic, just across the street, that we basically had all to ourselves. This beach and the quiet are the reasons to stay here, we loved our early morning sunrise walks and we basically had the ocean beach to ourselves even in peak season. The lawn is another star, especially at sunset with clear views to dramatic sun splashes and lit up pink skies. However, the hotel overall was a disappointment, rooms were extremely small and not at all stylish, aiming for quaint but falling short--it just felt drab and old. Bathrooms are also tiny with outdated fixtures and what felt like motel showers. As a member of the Relais & Châteaux group, one expects more, much more. The hotel needs a major design and revamp and could look toward its sibling, The White Elephant, where rooms are contemporary and chic. The staff was helpful but largely young and inexperienced with some exceptions. (They are supposed to bring chairs and umbrellas down to the beach for you, but often can’t be found.) The hotel is isolated and far from town, you can’t just pop in for a cappuccino, and we were frustrated that the coffee service started at 7:15, late for early risers. There was a bunch of us on the porch each morning waiting for our caffeine fix—would it be so hard to have a Keurig or Nespresso machine in the library or lobby? There is a complimentary hourly shuttle to town but it doesn't start till 9:30, and taxis and Ubers run some 30-40 dollars per trip in high season, about a 15-20 minute drive. The isolated location may be a plus for some, but we missed being able to bike in for a late afternoon snack or ice cream, and while the on-site restaurant Topper’s is very good after a day or two of their lunches we were ready for something else. If you decide to stay at The Wauwinet, we highly recommend you rent a car. Bikes were complimentary but old, when was the last time you rode a bike that braked by backpedaling, how about getting some newer models with hand brakes? On one of our trips, the gears were not working properly and we needed the hotel to come change bikes with us half way through our ride. (One would expect a good hotel to check their equipment before sending guests out on the road) Are we being picky? We’d be happy to overlook minor faults if the prices weren’t so exorbitant. We expected more from The Wauwinet and it didn’t deliver. Note: A good way to experience The Wauwinet and its picturesque setting is to come by boat for sunset cocktails and dinner. From town, reserve a ride on the Wauwinet Lady, an open launch that leaves from Nantucket Harbor for the hour ride to the hotel, complimentary for diners at Topper’s. Next time: Hands down the best thing to do is rent a house, but if only visiting for a few days, like we were this trip, our top pick would be The Residences at White Elephant Village followed by the Inn at White Elephant Village. For those who don’t mind being right in town, the new Greydon House is the hot place to stay with interiors designed by Roman and Williams. Never Again in August: High season tourist traffic has always been heavy, but the last few years Nantucket has become even more popular, and crowded, than ever, and the first few weeks in August are peak time. Hotels jack up their prices in the high season and taxis and Ubers are insultingly expensive. The line at Juice Bar for ice cream has always been legendary, but this summer was insane, with lines wrapping further down the block than ever before. The Nautilus has a same day reservation policy with the door opening at noon. A few years ago we went at 11:30 and were first on the line. This year the line started at ten with half the people waiting shut out of time slots. Yes, the food is delicious and inventive, what we consider the best on the island, but it's certainly not worth giving up two hours of beach time for a meal. And don’t even think of going to Black-Eyed Susan for a Thai breakfast scramble after nine. We still love Nantucket, and it has some of our favorite beaches anywhere but next summer we’re going in June or September, maybe we'd even consider July. For a comprehensive itinerary of the best things to do, see and eat on Nantucket click here for our essential guide to the island.